It is appropriate that I should be writing about Penelope Lively’s Heat Wave since our A/C is still non-functioning and the weather is starting to get hot. Then again, a heat wave in England is probably still more pleasant than a typical summer day here in DC where 90 degree weather and 80% humidity are the rule not the exception. This is probably why I failed to feel, or believe in the heat as Lively describes it. Not that her powers of description are lacking, quite the opposite in fact, it is just that I know better when it comes to English summers. I have lived through a couple of heat waves in England and they just don’t compare in the same way that all my whining about the heat in DC would be laughable for someone living through a summer in Southeast Asia. But back to Penelope Lively’s Heat Wave. The gist of the plot has copy-editor Pauline spending her summer in a two-family cottage in the English countryside. Her daughter Teresa and her husband and baby are staying in the cottage next door. As the bucolic summer starts to turn hot Teresa’s marriage begins to run into trouble. Pauline observes the tension through the lenses of her own failed marriage some decades earlier. As in most of her books Lively does a wonderful job writing about home and family in a way that is comfortable, and, I hate to say it, cozy despite the emotional strife she invariably inserts. 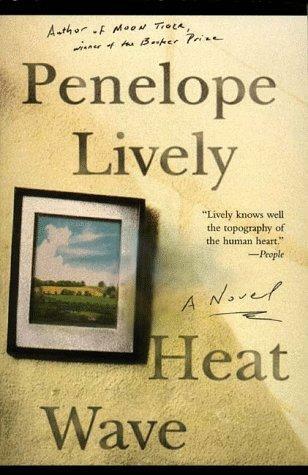 In Heat Wave Lively paints a picture nothing short of bucolic. Although she tries to poke holes in our romantic notions of country life, as I will write about shortly, I still couldn’t keep myself from thinking of composer Ralph Vaughan Williams’ aurally iconic “The Lark Ascending”. To me this is tone painting at its finest. Even without visual images to go along with it, I defy you not to be transported to some idyllic countryside setting while listening to this piece. This is only an excerpt of the piece and will leave you wanting to hear more. Hit the play button while you read the rest of this review…or better yet go get a recording of The Lark Ascending, go lay on the grass or in a field or somewhere outside and listen to it on your headphones. The perfect blend of nature and art. Meanwhile, back to this book review. Lively builds dramatic tension by using the expanding heat wave as background for expanding personal tensions. She also reinforces the notion that most things, once you scratch the surface are rarely what they seem. That underneath every pleasant surface is a complex and often contradictory set of factors that belie superficial observation. Thus her bucolic country cottage is surrounded by meaning apparent to those willing to look beyond what they see. Pauline sometimes thinks of the people who have lived at World’s End before her. The real inhabitants – those who lived here seriously, because they had to. She sees stunted people with skins ripened by dirt and weather. Most of these people would have been old at fifty-five – at her age – keeling over, heading for heir hole in the turf, worked quite literally into the ground. They would have looked rather differently upon the silver gleam of winter sunshine on ploughlands, upon the billowing gold of an August cornfield. All very fine for us, thinks Pauline – playing at Marie Antoinette, soothing the troubled soul with contemplation of nature. Time was, this place was for real. Worsham is doing good business. Raking it in. Each of these visitors will spend something, presumably, if only on refreshments and a postcard. Quite a few will fall for a pot of allegedly home-made chutney, or framed assemblage of dried flowers, or a patchwork cushion. Acquisition is one of the purposes of a day out, after all – the acquisition of new sights bolstered by something a bit more tangible. And Worsham has centuries of marketing experience – it has been a trading centre all its life, though traditionally for more essential commodities than dried flowers. Lively’s deconstruction of these tourist outings and other elements of her daily life feel interestingly dated to me. Published in 1996, the cynicism in Heat Wave feels very much of its time. Perhaps it is just my own personal experience in the 1990s. As a graduate student in American Studies in the middle of the decade, it was hard not to have a hyper-critical eye trained on the details of daily life. But it also seems like the decade was rejecting the la-la land of the Reagan ‘80s as it rushed to embrace the tech bubble of the ‘90s and the heady march toward Y2K. Correct me if I am wrong, but wasn’t the ‘90s the decade where we all became so fascinated with the recent past? With an attitude that said “we are enjoying this, but only ironically” we embraced swing dancing, Rhino Records started re-releasing nostalgic music collections by the score, TVLand came into existence filling cable TV with Mary Tyler Moore Mondays and enough Brady Bunch and I Dream of Jeanie to put us all in a time travel coma. Wasn’t this the same period when twenty-somethings started to carry lunchboxes and wearing t-shirts with Sesame Street characters? But we did it all with a wink and a nudge that said that we knew better. In many ways I feel like the cultural assessments in Heat Wave are indicative of the kind of critical reckoning that many of us had in the mid-90’s that eventually led to the “who cares, we know it is lame but are enjoying it anyway” late-90s and beyond. Lively’s criticism seems part of the trajectory of cultural criticism that eventually led some of us the “post” world. That is, the world where we got so tired of our own cynicism that we became post-everything: post-feminist, post-gay, post-racial. What else could explain how former warriors of the political correct movement turn into rabid fans of Family Guy like myself and so many of my college cohort? But I digress…Heat Wave is not as non-fictiony or complicated as all that. It is, I am happy to say, typical Lively. In fact, I would put it down as my second favorite Lively. Not as good as Consequences but better than The Photograph and Moon Tiger. I've never read any Penelope Lively, but I've been meaning to. I actually have a copy of Moon Tiger, so I hope I don't find it as underwhelming as you did! And yes, English summers are not exactly the stuff that heat and humidity are made of. After five years in Nashville, I still haven't gotten used to the intense heat here, and having traveled through most of Western Europe during the summer, I'd say England and the rest of the British Isles were our reprieve from the heat! Oh dear. You're doing without air conditioning? Mine went out a few years ago during a hot spell like this one, but I only had to manage for a couple of days (two movies and a play helped). I hope you're finding ways to stay cool. I have yet to read any Penelope Lively, despite having checked Consequences out of the library a time or two. This one does sound like a good one, so I shall keep it in mind for when I do get around to her, which I fully intend to do. I. Feel. Your. Pain. No air conditioning around here this weekend would be unpleasant. Hang in there! Bound to be fixed soon. And the money pit will be gorgeous and functioning before you know it. Never read any Lively but have thought about it of course. And you do make this seem promising. And it does seem a good summer read. That possibilities list for the library this week is getting a little unwieldy. Happy reading! Steph: I enjoyed Moon Tiger, I just didn't find it as wonderful as Consequences. MT is probably the superior book from a literary standpoint, but the subject matter and setting of Consequences is more to my taste. Teresa: By all means check out Consequences again and read it. I love that book. Frances: Not having A/C makes the walk to Metro feel much cooler. So there are small mercies. Mystica: I have Family Album in my TBR pile so I will be interested to read your review. The Lark Ascending is lovely – thanks for including that video. Your description of how the book evokes a bucolic setting despite the strife it depicts reminds me of my recent re-reading of Delta Wedding. There's a lot that's 'not right' happening in the book, but there's a languid nature to the Mississippi Delta that also comes out strongly. The book's take on tourist consumerism sounds interesting. Having worked in Bar Harbor, ME for four summers, tourist consumerism was what I observed every day. People wanted stuff locally made in Maine, but the inexpensive stuff was not usually locally-made. Yeah, that lighthouse windchime was probably made in China. I hope you get your a/c back soon. They're saying it may reach 100 degrees around here this week! Christy: Thanks for the comments on The Lark Ascending. It is nice to get feedback on non-book items. I have read a few Welty books, but I don't think I have read Delta Wedding. Love the music, thanks so much for including it. It did make me want to pop on the headphones and head outside. So sorry about the A/C and praying that it gets fixed SOON! I got all excited by your title when I thought it was a Penelope Fitzgerald I hadn't heard of… you've got your Penelopes mixed up! ;-) Easily done. I often do it, only I throw Penelope Mortimer into the mix. Susan: Supposedly the AC gets fixed tomorrow. Simon: Thank you! I have corrected the error. though mine is not as elaborate as yours. would love to have your feedback on it.